The Law Library is open to the entire University community as well as to the general public during posted operating hours. During exam periods access to the library is restricted to law students. Patrons in need of access to library materials during these times should contact the Circulation desk at 434-924-3384 for assistance. The library's regular hours are 8 a.m. to midnight daily (with extended hours during exams and an abbreviated summer schedule). Patrons are not permitted to be in the library while it is closed. The doors to the law school building are automatically locked from 6:00 p.m. to 7:00 a.m. on weekdays, and on weekends. Current UVA affiliates can get law building access added to their id card by contacting David Holsapple at dholsapple@law.virginia.edu. The main entrance to the Law School offers handicapped parking and automatic doors for wheelchair accessibility. The rear entrance offers a ramp and automatic doors that lead to an elevator to the first floor. Those who need assistance should call the Circulation desk at 434-924-3384. University Computing Account. 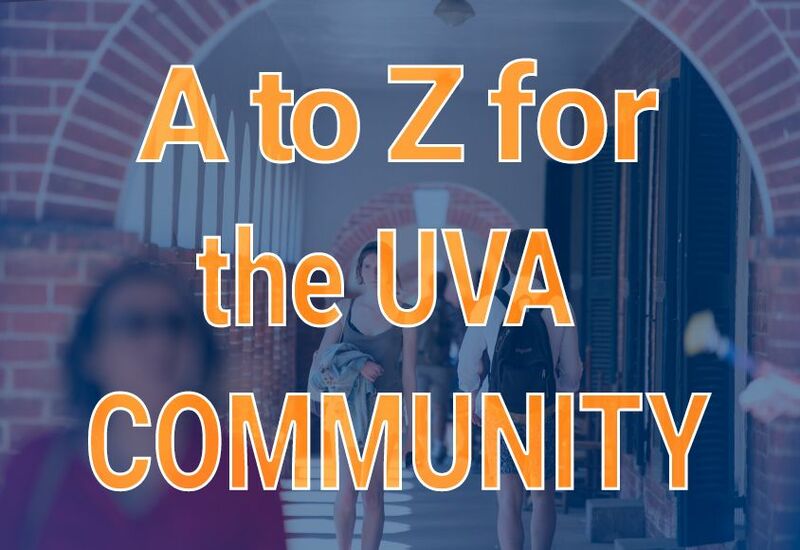 This is UVA's main computing account for UVA students, faculty and staff only. The computing ID is typically used with Netbadge, Home Directory, and the Lawschool domain (see below). Lawschool Domain Account. This is used for logging into the Law School's computer network for access to the LawWeb intranet and networked printing services. Non-Law patrons may establish Guest accounts as described below. Eservices login is not available on the library's public computers. Library Databases, Lexis & Westlaw. Most library subscriptions to electronic resources are restricted to users on the UVA network and do not require an individual login. Two exceptions are Lexis and Westlaw which are for law student use only. Non-Law patrons may use LexisNexis Academic, which is available UVA-wide. Photocopying, Printing and Scanning Account. Non-Law patrons may create a Guest Login Account (see below) to enable network printing and track their printing and copying charges. The Law Library welcomes the donation of books and gifts that enhance learning and support instruction at the Law School. Donations and gifts will be reviewed and accepted based on our current collection development policy. Donors may request that books and gifts that are not needed be returned, otherwise they will be disposed of properly. Accepted gifts and books become the property of the University of Virginia Law Library. Appraisal of accepted gifts and books will be done by the donor and not by the Law Library. Donations and gifts are handled by the Library Director, Amy Wharton. Study carrels are available to faculty research assistants, L.L.M. and S.J.D students, and law school journal members for a semester or year. There are unassigned carrels on all three floors that can be used by anyone on a first come, first served basis for private study. Most of the computers in the library require a login and a Law School computing account. Courtesy computers are available for patrons who do not have accounts. They are located near the Reference Desk on the second floor. These computers are reserved for short-term academic and legal research use only. Printing is not available, so patrons are encouraged to use cloud storage or USB flash drives to save the results of their research. Multifunction printers, copiers and scanners are located throughout the library for law student use. Printing and copying fees for Law students vary from 5 cents per page for pre-paid accounts to 25 cents per page for color printing. For complete information on the multifunction printers in the library and instructions on setting up your account, see the Printing, Copying & Scanning FAQ. Non-Law patrons should inquire at the Circulation Desk to find out about the printing/scanning options available to them. The DVD and video collection is available for checkout only to students, faculty, or staff members of UVA. The loan period is for 7 days. Students may borrow up to 2 titles at a time, and returns may be made to any UVA library. UVA students, faculty and staff may request materials from other libraries. Registration is required. An increasing number of online resources are becoming available through sites that are friendly to mobile devices. We're also working toward enhancing the Law Library website to provide a better experience for our mobile device users and to provide information about apps that are useful for research. Visit the mobile site and let us know what you think. When materials are returned late and fines have accrued to $10.00 or more, the user is billed. Bills should be paid within 30 days and can be paid at any University Library, except Health Sciences. Bills unpaid after 30 days are referred to the University Student Financial Services for collection. Library privileges are suspended and students are barred from registration, graduation and other University-wide privileges until the account is settled. When materials are not returned and become long overdue the user is billed for replacement cost and library privileges are suspended. This includes use of Special Collections, Interlibrary Services and LEO book delivery. If materials are not returned or paid for within 30 days of billing, the bill is referred to the University Student Financial Services for collection. This action bars students from registration, graduation and other University-wide privileges. Accounts that have not been referred to Student Financial Services may be cleared at any library circulation unit by returning the items and paying the fines. If the account has been referred to Student Financial Services, payment must be made there (Carruthers Hall). Payment for materials found and returned within 90 days of payment will be refunded. Prompt response to bills from the library will avoid referral. Visitor parking is very limited at the Law School. There are several spaces in the lot on Nash Road that are reserved for guests of the Law School and for people requiring accommodation. Guests must register at the receptionist's desk in Clay Hall to receive a parking permit. There are also some metered spaces in the D2 lot. Street parking is available on Arlington Blvd and on Millmont Road.